As the first official post, I think it would be due to present a review of the book that contributed, even partially, to the inspiration for the title of this blog. 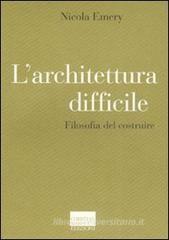 L’architettura difficile – Filosofia del costruire is the last book by Nicola Emery, professor of philosophy and aesthetics at Mendrisio Academy of Architecture, Switzerland. «Today architecture gains a great success: the more it becomes spectacular, the more it gets spectacularized. But this success itself could be indicative of a crisis of sense. And a crisis of sense starts when a discipline loses the essential causes of its own existing, acting, projecting and building. Looking for a really not minor part of contemporary architecture, the one most frequently shown on every kind of magazine, the impression is that architecture ends in a series of shapes, more and more unusual and almost incomprehensible. But all these shapes, just as in fashion, soon get to a certain tire and, overworked, quickly lose their value. In this situation it seems just right to make a philosophical reflection upon the aims and essence of building. A reflection, like the one made in this book, that faces seriously and rigorously the meanings attributed to architecture by Plato as first and then by many other thinkers – Martin Heidegger, Georges Bataille and Jeremy Rifkin among them -, architects, Bruno Taut, and artists, Mondrian, the Situationists and Josef Beuys in particular. The result is a philosophical map, necessary to understand and criticize contemporary and also to find better answers in projecting, with a not-ephemeral sense and value. An older Plato, for those who lost the aim of preserving the wealth for the territory as a whole and just longed for a private interest, suggested control, censure and even “the beatings”… He probably exaggerated, but today we should start a rediscovery of the virtues of creative self-control, with the aim of a space decolonization. There’s no doubt this is an ambitious project, but it’s even more fascinating since quite close to our inquiry field. Nevertheless, reading this essay left me with a series of uncertainties. In my modest opinion, the worst fault of the book is to be found in the highly fragmented structure of the argumentation. The book, indeed, is divided in four sections that are apparently and actually mutually disconnected. In the first one, with the title of The law architecture: Plato, a path of urbanism and architecture is reconstructed inside the books of Laws by the Athenian philosopher; a very interesting path, not lacking about hints of modernity despite its historical location, that the reader expects to end in an organic analysis of some possible conclusions in line with the general plan of the book. Just read these partial conclusions to the first part, one immediately plunges into the second, looking for new, stimulating shades of the same dissertation, maybe as seen in a different historical context. And then one has to face the Abstraction and Metropolis: Mondrian section, with its lapidary incipit: «Mondrian’s identity is in the itinerary.». Lapidary and quite enigmatic for the disoriented reader who has just left Plato on his back and doesn’t know that he (she)’ll have to do with a dissertation – even by itself thrilling – about the Dutch painter that will be long more than one third of the whole book. If the artist’s personality is absolutely magnetic and the study about his Calvinist obsession for the research of ways to express the “real” leaves no room for bore, there are really a few references to architecture (some hints to De Stijl and to Le Corbusier’s shortsighted opinion about it) and the reasons that led the author to insert this section in this book are definitely obscure. Then it is the turn of the third part, entitled Space decolonization. Finally, Emery hits the mark, and the essay is actually useful. Wheting the first chapter, that criticizes Popper’s “piecemeal tinkering” when applied to urbanism. The need for overall urban visions clashes with the effectiveness of complex urban evolutions. Are we still allowed to think a townplan as a whole project, or is it a preindustrial anachronism? The rest of the section is full of remarkable points of view too. The questions of sustainable development as seen by Heidegger, Rifkin, Bataille, Beuys, Debord, just as the back cover announced and the hungry reader expected. It’s really a pity that just sixty pages have been dedicated to this issue, which could (should?) have well been the core of the entire work. In the end, the last short section reprises some platonic positions, but much more shallow, and concludes the essay with a fascinating “gloss” with Bruno Taut adding something visionary, but nothing new to the central meaning. In conclusion, as I said, the work is interesting even just for the ambitious aspire initially proposed; but as it often happens, it is probably a later collage of professor Emery’s personal studies, and he indubitably owns a rich and complete vision of the matters presented, but maybe this time lacks in the will of making clearer those relations (obvious for him) that link the interesting investigations made in so many distant fields of knowledge. This slightly sour review be not an offense for the professor, whose effort, as said, truly inspired me in opening this blog and, more, who is obviously invited here to sincerely discuss on what has been written. It would be a greatly appreciated debate: I really hope this happening. No malice!